In August 1962 Judy Garland made this recording to be played at the UPA (United Productions of America) sales meeting. 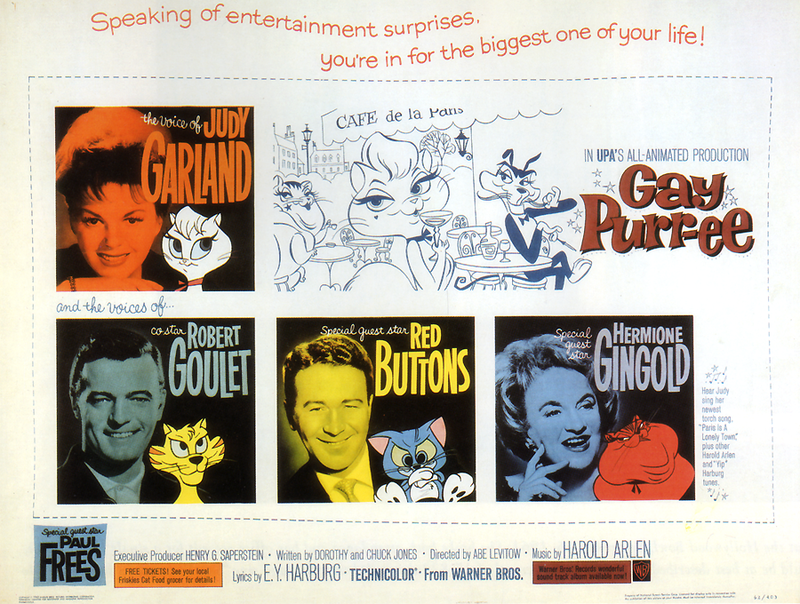 UPA, via Warners Bros., was about to release the animated feature Gay Purr-ee featuring Judy’s voice as the main character, “Mewsette,” and co-starring Robert Goulet, Hermione Gingold, and Red Buttons. This recording was taped by Judy while she was in Lake Tahoe in mid-to-late August 1962. She was there to lose weight and rest before going to Las Vegas for a six-week engagement at the Sahara Hotel. Judy humorously goes off script when she comments “It’ll increase the sales of Friskies, too!,” resulting in some giggles in the background (maybe daughter Liza?) before she stops the tape recorder. Friskies had an exclusive tie-in promotion with the film, offering free tickets with the purchase of its cat food. The recording was sent to Los Angeles to be transferred to disc and then sent to the UPA sales meeting where it was played for the executives and then went unheard (and unknown) until it discovered in the effects of a deceased Hollywood sales executive. This previously unreleased recording is presented here thanks to the generosity of collector John Newton. Thank you, John! Time Warner Bros issued this as a restored HD Blu Ray disc. I would be a Pre-order buyer if or when they do. It would be great if they did issue this, remastered on Blu-ray. I agree!